Mami is a woman who has a lot to say. Of course we met accidentally in Tokyo, in a coffee shop. She noticed a confused visitor (me) and offered sound advice about something. Just that vocal forwardness took me aback. Mami was cracking jokes and had questions about WOW Woman platform while offering alternative ideas and disagreeing with this and that. Long story short, we hit it off immediately. By the end of our chat, we set a date to meet again, as if we were old friends. What makes Mami a WOW Woman? Mami challenges you to think, think quickly, on the spot. I absolutely adore her approach to life, her very direct, bold, completely all-in style of addressing challenges (and her style in general). It seems to me that in Japan she is a unique woman, her attitude, ambition and audacity. Also, don’t get me started on her sassy and sharp sense of humour! I had to google, on several occasions the quote, location or person she names in the feature. That’s a win in my book! Mami has a dream, is a truthful filmmaker (I’ve seen her film and also heard about her ambitious plans for the future projects), and is making her mark in a male-dominated industry, fighting for uplifting strong Japanese women. Simply a WOW Woman! The following answers are written by Mami (with very minor spelling/grammar tweaks from me). Please keep in mind that English is a second (or third/fourth..) language and is not 100% perfect . Perfect is boring anyway! Enjoy and take an opportunity to learn about another person’s culture through her writing. Mami Sakuma Taoka (“Mami” means “True Beauty” in Chinese characters. My deceased father named me). I was born and grew up in Iidabashi neighbourhood next to Kagurazaka, Tokyo. Kagurazaka was famous as the town of Geisha-san and I had learned the Japanese Dancing with them when I was a kid. Currently, an independent film director/writer/editor who is committed to being a leading professional. And also I make a living as a researcher of the video production department of an advertising enterprise in Tokyo. On my 40th birthday I swore that I would be a leading professional filmmaker. At that time, I couldn’t speak English, had no budget to go to film school, and was faced with the worst health condition. But as I turned 40, I felt it was the first moment for me where I chose to fight for my life and the future. Two years later I had an opportunity to concentrate on studying English for only a month, when I suddenly got 825 points on the TOEIC (English language test designed specifically to measure the everyday English skills of people working in an international environment). Although 825 doesn’t sound high enough me right now, at the time I did realize that my brain could reply to my efforts even I’m in my 40s (hahaha). I became a good striver since then. Of course there was no insurance that I could be (and can be) a film director, but for me, it didn’t matter at all. Because It seemed to me that one’s life doesn’t depend on a natural-born talent or an ability. It depends on how much I can pour into my passion and my craft. Decide on what I would love to do for the rest of my life, and go for it. That’s my foundational thought. Passion is everything! My first opportunity came at 43. That plan was to make a short documentary film about Ms. Etsuko Takano (1929-2013), the general manager of Iwanami Hall and a famous female developer of Japanese film industry. I used to wake up at 4 am to read her books, taking in every detail, because I was an ordinary office worker and didn’t have time during the day. Unfortunately, I brought on the anger of the the resource organization so that I had to give up making that documentary. However that experience taught me a lot. I learned all about Etsuko Takano’s spirit, learned that I had to be much more cautious against people who tried to crush me. I became too tough to be broken. That was the turning point of my film life. I then met Philippe, an understanding friend of mine, and he introduced me to Kenneth (Ken) K. Trufant (Filmmaker/Performer/Motion Picture Producer). I asked Ken to be a cinematographer of my first film. Ken guided me on how to complete pre-production of the film and I did the work according to his advice. I wrote a story, a screenplay, drew the storyboards, made a still photography’s storyboard with framing ideas, and gathered the people, just like that. Ultimately we shot a 6min 37sec film. We spent 5 months editing because everybody had full time jobs. That is my maiden film, “A Sleeping Dream”. “A Sleeping Dream”was selected as an official selection at the Atami International Film Festival. (This year, there were 1508 submissions from 89 countries at Atami film festival). The film was also selected and awarded a Best Asian Film Award at the Toronto International Nollywood Film Festival 2018. I am now making another blueprint of next feature film. I have only a high school diploma, but I had completed the online college specialization “Learn English: Intermediate Grammar” at the University of California, Irvine in 2018 (and I aced three of four of my classes, yay!). Currently I am attending the Lights Film School, an online film making school. Life is shorter than I thought when I was 20. But my life became much more worthy than in my youthful days. My biggest disappointment? Okay.. A GUY BROKE MY HEART 4 MONTHS AGO!!! Ouch, that is the biggest pain for every female, don’t you think so? The plan to overcome that problem is currently progressing. But I can say two things: (1) I believe I am a good fighter to overcome any obstacles and (2) I can make a good romance film in the near future. I always rise after a fail. There’s nothing too late for our lives. However, it is also true that life is a short trip (as the song of Beyoncé and Jay-Z teaches us). If you wanna do it, then do not hesitate to do it. Give it your passion immediately! I believe in “all that we can be”. Although I have had experience with numerous females trying to crush me, I never do the same thing to other females. I want to trust my human nature until the end of my life. As Etsuko Takano used to say, “ I never flow to low”. Like that I would like to open the paths to other female directors even if I don’t succeed in the future. If I can be a person I am describing now, the world might be a better place for us, women. I surely hope so. Fortunately, I have two places where I feel “tallest”. One of them is The 8 Days Cafe in Otsuka, (Tokyo, my hometown), another one is Starbucks of Akasaka Biz Towers (in Tokyo). Because both of them have free power supplies /free Wi-Fi so that I can work on preparing for my films as much as I want, hahaha. Actually, I’m quite a good singer. I shared a stage with Gerald Wiggins Trio when I was 23. Wiggie was the teacher of Marylin Monroe. Singing fits my personality, helps to express my emotions. But the problem is sometimes (or all the time) I cannot help but sing loudly, even when I am at the office, public roads. Just for your information, I am not a crazy person, just a crazy filmmaker. I would like to make a living as a leading professional filmmaker within three years. I would also like to make films with the filmmakers from all over the world. Each government is crazy, but we the ordinary citizen, including the filmmakers, shouldn’t be. That way we can unite as friends and make films. You know, I lost my parents and have no family. I may end up living by myself until the end of my life. That’s one of the fears that I definitely should overcome internally. I have already been born the way I am, so I have to obsess a little about this question. Let’s see….maybe I would be a mother? The films that I see in the movie theaters, music, my friendships. I forgot couple of crucial things: enjoying fashion and make up, to make myself beautiful and comfortable. I hope that all the corruptions of our current prime minister Shinzo Abe’s administration and the government (Liberal Democratic Party, New Komeito) will be properly disclosed and hope that they lose immediately. I hope that the Japanese Constitution such as the basic principles of the Constitution (Respect for fundamental human rights, Popular sovereignty, Pacifism), The Article 9, the Peace Constitution, will never be eliminated (because Shinzo Abe’s administration seems to be committing to selfishly getting rid of these). I hope that Japan will never invade other countries again, so that Japanese cannot hurt anybody ever again. I hope that all nuclear weapons and all the nuclear plants cease to exist. Wow, I have too many things that I want to write about. Ultimately, I hope for peace all around the world. Being a trustworthy and gentle person to others. Showing inclination for friendship with no hesitation. Making efforts to implement your dreams into reality each day. “The shooting script of The Shawshank Redemption” by Frank Darabont. “The Princess Diarist” by Carrie Fisher. “The Buried Giant” by Kazuo Ishiguro. 1st WOW Woman I chose is my mother. She delivered me when she was 21, she entered the dental school when she was 24, then finished her PhD while raising me. She had been acting as a leading oral surgeon to care for the cancer patients. I miss her a lot. 2nd WOW Woman I chose is Ms. Etsuko Takano (1929-2013) who was born in China. Her books taught me about pacifism, about ways to empathize with other countries, especially the Asian countries Japanese Army invaded during WWII. She also taught me about feminism and ways to help open paths for other females. Unfortunately I never got a chance to meet her but I got the passion of her spirit through being educated by her books. 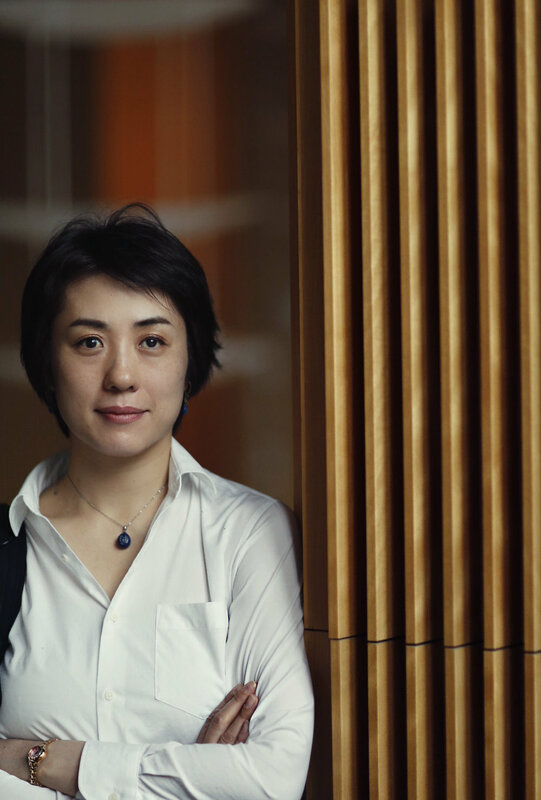 3rd WOW Woman is Ms. Atsuko Hirayanagi, a Japanese director and the writer of “Oh, Lucy”. She has an incredible talent at depicting comedy and essence of human beings. I admire her a lot. The short film “A Sleeping Dream”Facebook site. Atami International Film Festival site. Introduction page of Mami Taoka as a filmmaker.